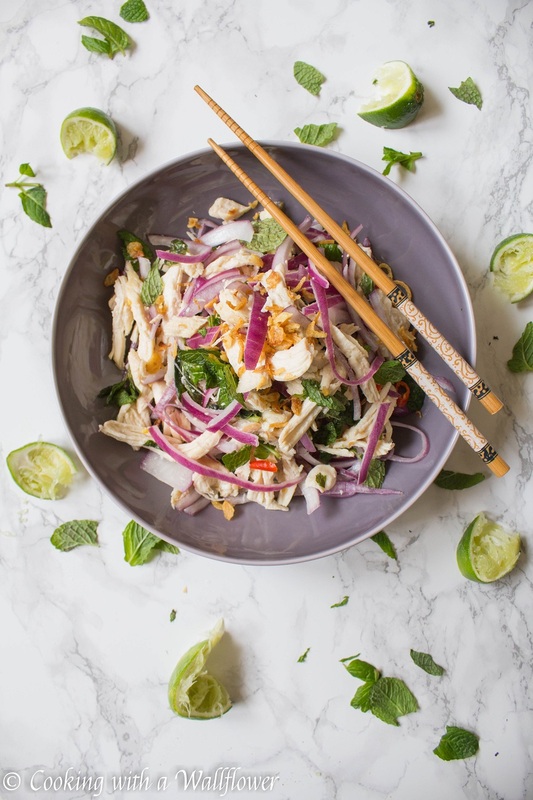 Shredded chicken tossed with torn mint, red onions, and fried shallots. 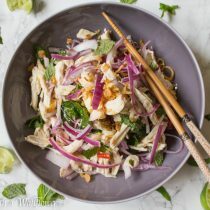 This Vietnamese shredded chicken salad is simple, delicious, and perfect as an appetizer or a light meal. I’m home from vacation for a few days now, and I wish I was still on vacation. As always. I spent almost a whole week indulging in southern comfort food and eating to my heart’s content, or more accurately, my stomach’s content, all the crawfish and beignets that I’ve been craving and dreaming of for years. We have Cajun restaurants in the Bay Area, but it’s just not the same! If you haven’t been to New Orleans before, I highly recommend it. The most amazing food, the most beautiful architecture. Foodie heaven. And a week was just NOT enough. That said, southern comfort food can be really heavy. Halfway through the week, I felt like I needed lighter meals. Something that wasn’t fried, something that wasn’t covered in loads of butter. lol. Now that I’m home, I feel like I need lighter meals, at least for the next few weeks. So… we’re going to start simple. Because I’ve been on vacation for a week, and I still feel as though I’m on a vacay mode. 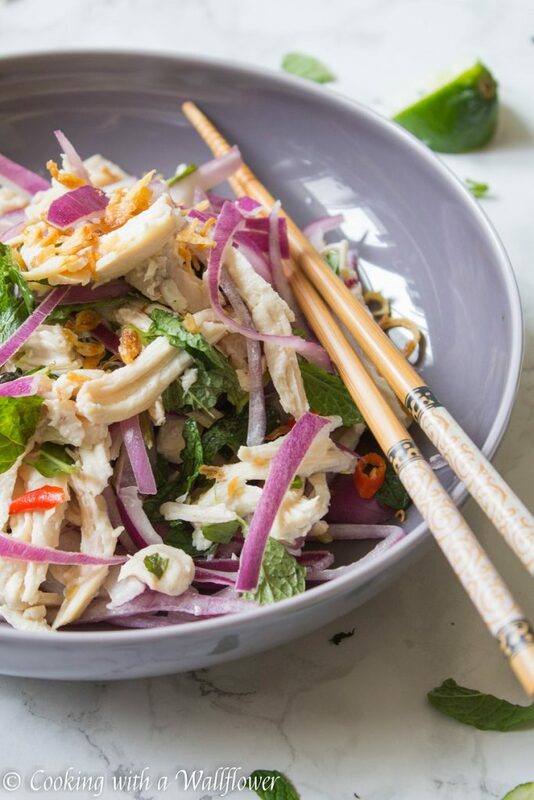 This Vietnamese shredded chicken salad is as simple as it can get. There are actually various versions of this salad, but this particular one is called goi ga xe phay. Two main ingredients: shredded chicken and onions. 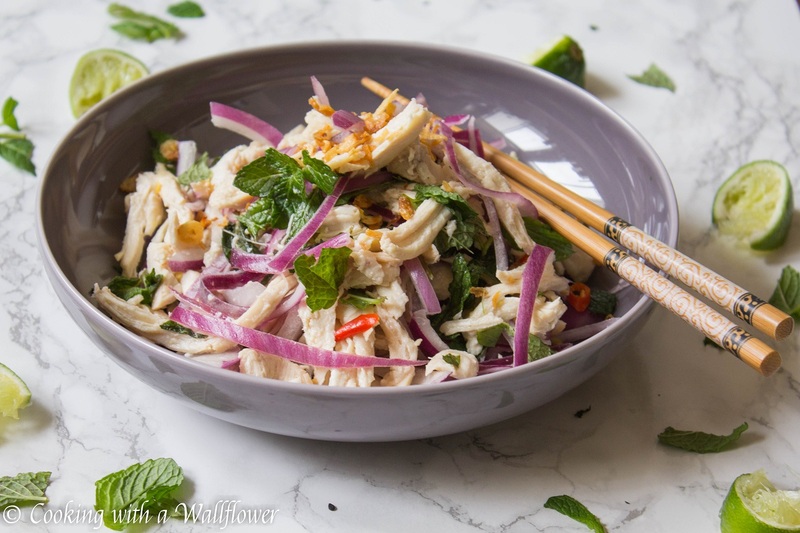 This chicken salad is lightly seasoned with lime juice, sugar, and salt. Basic ingredients that you most likely have available at home. If not, a quick run to the grocery store. So good, so simple, so refreshing. In a large bowl, add shredded chicken. It can be leftover or freshly cooked. Add thinly sliced red onions. The thinner the onions, the better. The lime juice will help soften the onions. Add freshly torn mint leaves or basil leaves. Squeeze fresh lime juice over the salad. Add granulated sugar and salt. Mix until all the ingredients are well incorporated. 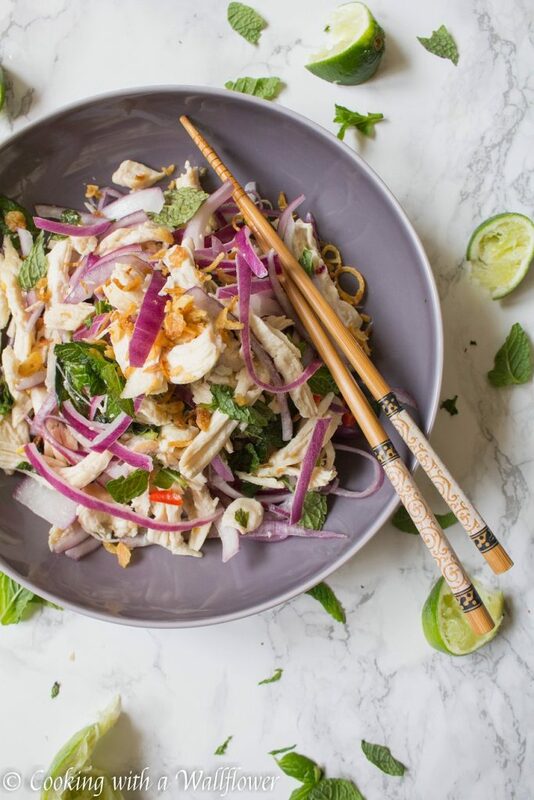 Top with more freshly torn mint leaves and finish with a generous amount of fried shallots. 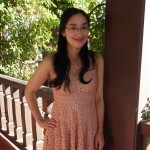 You can make your own fried shallots, but I get mine pre-made from the Asian supermarket. It’s super convenient to have on hand when you need to garnish salads or soups. Add sliced red chili pepper if you like a little spiciness. Serve the Vietnamese shredded chicken salad as a light meal or a side. 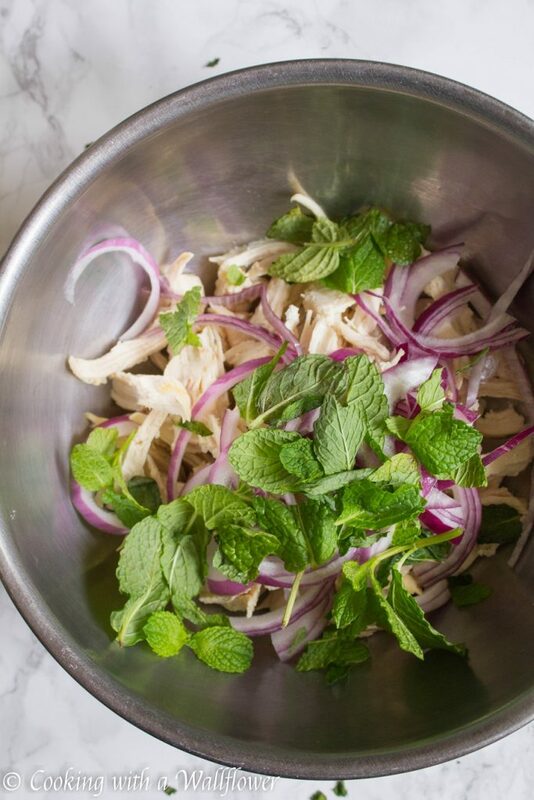 In a large bowl, add shredded chicken, thinly sliced red onions, and freshly torn mint leaves. 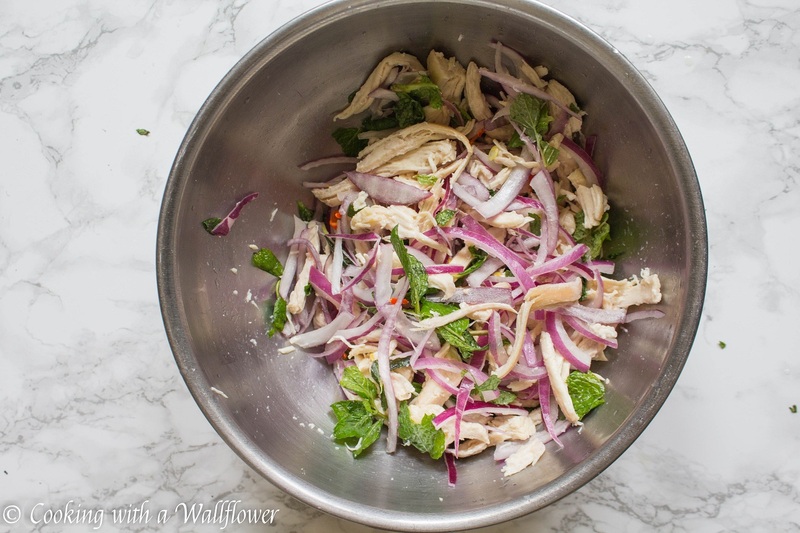 Squeeze fresh lime juice over the salad. Add granulated sugar and salt. Mix until all the ingredients are well incorporated. 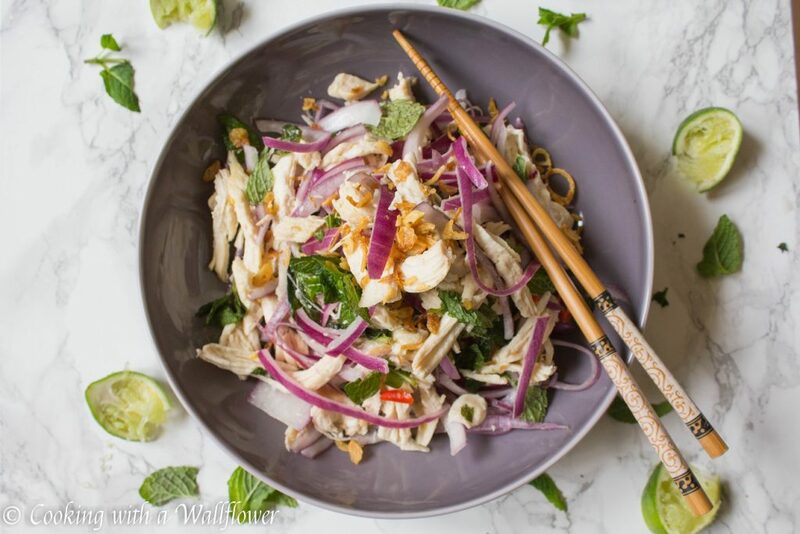 Top with more freshly torn mint leaves and finish with a generous amount of fried shallots. Add sliced red chili pepper if desired. 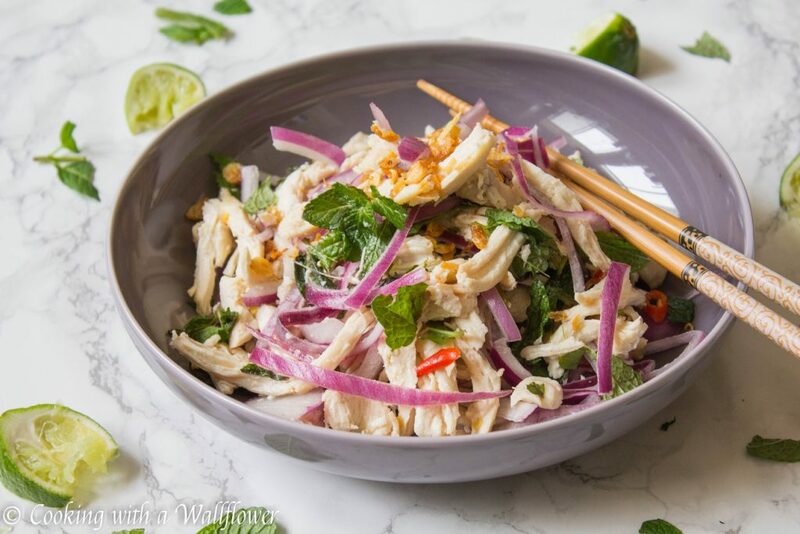 This entry was posted in Appetizers, chicken, Entree, Farmer's Market, Gluten Free, Quick and Easy, Recipes, Salad, Sides, Spring Cravings, Summer Cravings and tagged chicken salad, entree, gluten free, quick and easy, salad.